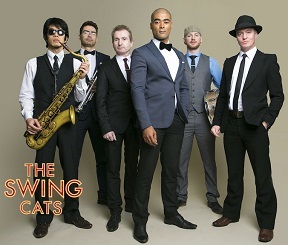 The Swing Cats are a six piece swing band consisting of lead vocals, a two piece brass section, piano, drums and double bass. Their live set is focused on up tempo hits from the swing dance era of the 1940’s and 50’s, featuring tracks from swing music legends such as Bobby Darin, Louis prima, Louis Armstrong, Frank Sinatra and The Rat Pack. While immersed in the music of the golden age of swing and the American big band swing era. They have a unique, modern and contemporary twist on this music genre, which gives them a brand of high energy swing music making the dance floor very welcoming to people of every age. They are the perfect band for any theatre, corporate, gala, festival or wedding event. Over the past five years they have performed more than 450 shows and are currently one of the most in demand bands of any genre in Ireland. To book The Swing Cats or to talk to us about your event requirements, please submit the enquiry form or call us on 087 718 1360.